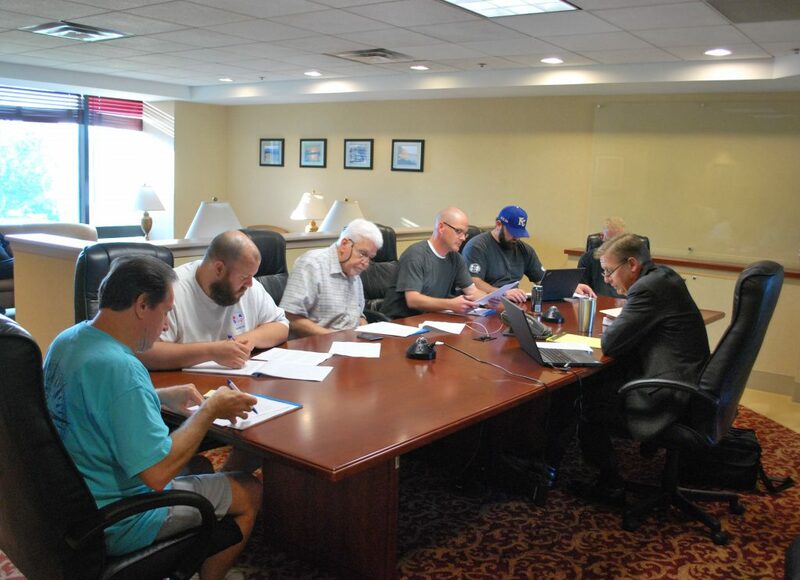 Members of the IAM Local 176 Bargaining Committee take part in a bargaining simulation with William W. Winpisinger (WWW) Director Chris Wagoner, right, playing the role of the company. The exercise – the highlight of WWW’s Negotiation Preparation for Bargaining Committees Program – is designed to give bargaining committees a realistic taste of the frequently-intense atmosphere at the bargaining table. Members of the Kansas City IAM Local 176 Bargaining Committee were among the latest groups to complete the Negotiation Preparation for Bargaining Committees Program at the William W. Winpisinger (WWW) Education and Technology Center in Hollywood, MD. The group spent a week learning, planning and developing a strategic, constructive and unified approach to their upcoming negotiations with Harley-Davidson in 2018. As part of the program’s customized training modules, the Bargaining Committee worked together to produce tools and plans specific to their members and upcoming negotiation. Training topics included how to draft contract language, present proposals, analyze the company’s strengths and weaknesses, mobilize and communicate with members – plus more. The week culminated in a bargaining simulation – the highlight of the program – designed to give the committee a realistic taste of the frequently-intense atmosphere at the bargaining table. The special training months ahead of negotiations is especially important as the IAM, in a joint statement with the United Steelworkers (USW), recently announced its decision to withdraw from a two-decades old partnership agreement with the motorcycle-maker. The IAM represents Harley workers in Kansas City, Milwaukee, and York, PA.
IAM Local 176, the first group scheduled at the bargaining table, is composed of approximately 425 members. Their contract, which expires July 31, 2018, is coordinated bargaining with the IAM and USW.